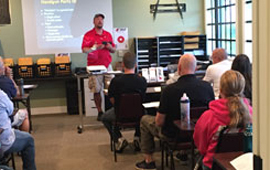 All of our classes are taught through Firearm Safety Group. The Illinois Concealed Carry Class is open to law abiding U.S. Citizens who are at least 21 years of age and wish to carry a concealed handgun for their personal or family’s safety. In this course, you will gain the required knowledge of handgun safety, along with learning about responsible carry and how to gain the needed proficiency skills with a firearm. Also there will be instruction on the laws and the obligations of the concealed handgun carrier. Upon the successful completion of this course you will receive a certificate from the Firearms Safety Academy which will be needed to apply for a Concealed Carry Handgun Permit with the Illinois State Police. IL State Law relating to the use of lethal and deadly force. Prohibited carry locations as a IL CCW permit holder. Course attendees must pass a practical proficiency test on the firing range, scoring no less than 70% with a minimum of 30 rounds, fired at distances of 5 yards, 7 yards, and 10 yards. Included in the cost of the course are targets, and other materials required when applying for permit. A handgun along with at least 90 rounds of ammunition (NO RELOADS) along with strong side holster that covers the trigger (no shoulder, small of the back or pocket holster allowed) and two extra magazines or speed loaders, hearing and eye protection. A valid and correct IL Drivers License and FOID card must be presented during class. Students completing this course will receive a certificate in addition to printed materials useful for future reference. please leave the ammunition in your vehicle and be sure to unload the gun and magazine before coming to class. Never bring ammunition into the class room!! For Class Schedule and Pricing. Teaches the basic knowledge, skills, and attitude for owning and operating a pistol safely. No FOID card is needed to attend this class. This course is at least 4-5 hours long and includes classroom and range time learning to shoot revolvers and semi-automatic pistols. Students learn rules for safe gun handling; pistol parts and operation; ammunition; shooting fundamentals; range rules; two handed standing positions; and continued opportunities for skill development. 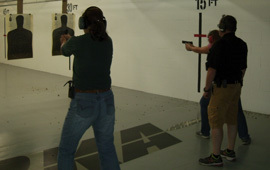 Women Only Intro to Pistol and FSG Defensive Pistol have been added to the schedule. Full descriptions of these classes are listed under the headings. Must place all hits on targets from 12 feet. This Is NOT A Timed Event. Amount of ammo used for Qualifying is based on the lowest ammo capacity of magazine being used in class. Target illumination Strobe effects on the eye and brain. Must place all hits on target. This Is NOT A Timed Event. No Bent Elbow Shooting. Amount of ammo used for Qualifying is based on the lowest ammo capacity of magazine being used in class. 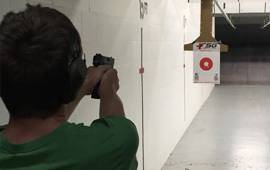 Youth classes provide shooters ages 8+ with an introduction to the knowledge, skills and attitude necessary to handle and operate a pistol safely. Includes classroom time covering revolver and semi automatic pistol knowledge, fundamentals of shooting; maintaining the handgun; hands-on practical exercises. Some classes include live fire training. Firearm & ammunition included. Some classes a parent/guardian is not required. Full description are in the Calendar. These class are limited to 12 to better serve the needs of our students. CMT (Center Mass Training) Club is a group dedicated to keeping their firearm skills current and relevant. Enjoy a mixture of theory and practical knowledge with encouragement and feedback regarding performance as well as refining your bag of techniques. RKA Gun Gallery and Firearm Safety Group have developed training scenarios that are designed to invoke firing under stress and involve movement drills, verbal commands, the use of cover and concealment and assisting in overcoming the physiological responses that occur in life threatening situations. Our goal is to bridge the gap between the range and real life. FSG Defensive Pistol Level 1. Semi automatic pistol, strong hip holster, mag pouch and 2 magazines minimum. Factory Ammunition – NO RELOADS. Members will receive 5% off all ammunition purchases. All guns must be cased. Guns and magazines must be unloaded before entering the range. Ear and eye protection must be worn at all times inside the range. Guns will be uncased in the range and inspected to ensure they are unloaded and clear prior to holstering. ONLY HANDLE GUNS WHEN INSTRUCTED BY RANGE SAFETY OFFICER. 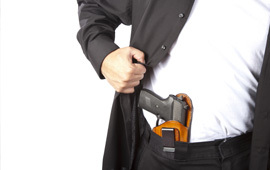 Club members may not roam the store with open carry holster gun. Firearms must be concealed in the store. Club members must obey all club rules. Club member must obey all RKA Gun Gallery range and store rules. Club members are subject to forfeit their membership, without refund, at any time for failure to abide by club rules, range rules, insubordination, unsafe or dangerous gun handling. There is an annual non-refundable registration fee of $250.00. This registration fee guarantees our instructors with different lessons/scenarios each month. CMT will be offered twice a month. The same lesson/scenario will be the same for both meetings. This will hopefully help with any scheduling conflicts you may encounter. A $15 per meeting will be required before each meeting you will attend. Each meeting will be a maximum of 10 people for safety reasons. This is a first come; first served basis. You many reserve you spot in advance with a credit card or coming to RKA Gun Gallery with cash or check. This fee is non-refundable as this will secure your spot in the meeting. Since this is scenario based club, we will require each student to take Defensive Pistol 1. Firearm Safety Group is offering a 50% discount to those who have not taken it. If you have already taken FSG's Defensive Pistol 1, you must be evaluated by our instructors prior to attending the first club meeting. This is for everyone's safety! We want everyone to be confident in holster skills as well as safe in the range. At any time, if an instructor or employee deems you unsafe, disrespectful or believed to be under the influence, he/she has the right to ask you to leave the meeting/building/range without refund. If this becomes an issue multiple times, you may be banned from future meeting/building/range events. All participants must agree to follow all range rules provided by RKA Gun Gallery, Firearm Safety Group and Center Mass Training Club. All participants must have valid FOID cards and comply with all local, state and federal laws. If you have just recently purchased an AR-15 rifle and you would like to learn how to use it properly, this class is for you. This Introductory course is developed for the absolute beginner and enthusiast alike. We will take you through techniques, loading, shooting positions, cleaning, maintaining and storage. 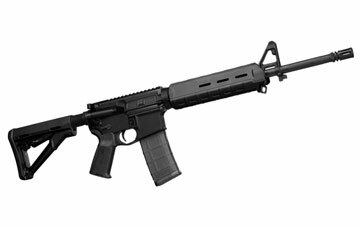 This is designed for students with the basic understanding of the AR 15 platform. 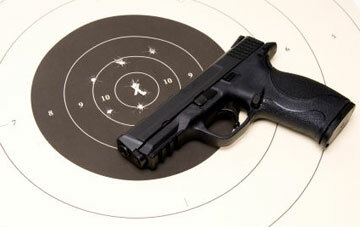 There is a brief classroom portion then to the range where a majority of the training is done. Shooting positions, ammo, sight picture and sight acquisition, bullet trajectory and zeros will be presented at this time. In this course, we will cover safety, the proper care, use and storage of a shotgun and rifle. We will be discussing the different types of the firearms and help you decide which firearm is the best for you. We will be covering different types of ammunition and understanding their purpose. There will be time in the classroom where you will learn of range rules, etiquette, proper hold and stance. Class will move to the range to have the opportunity for shoot both a rifle and shotgun. A FOID card is not required. Course is designed for teaching children 10+ for hunting season. Children ages 10-15 are free with paying parent/guardian. NOTHING! Firearm Safety Group provides everything you need. This course teaches the basic knowledge, skills, and attitude for owning and operating a pistol safely. The minimum age limit is 16 yrs. old and must be accompanied by an adult. No FOID card is needed to attend this class. This course includes classroom and range time learning to shoot revolvers and/or semi-automatic pistols. Students learn rules for safe gun handling; pistol parts and operation; ammunition; shooting fundamentals; range rules; two handed standing positions; and continued opportunities for skill development. This fee includes use of firearm and ammo (22 caliber, only). * NOTHING! 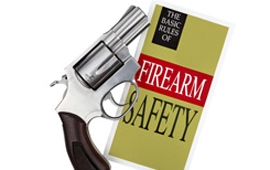 Firearm Safety Group provides everything you need. So you have shooting down pat, but you want to improve your speed while keeping your accuracy? This course is perfect to help sharpen your skills and prepare you for shooting under a clock. After this class, you’ll impress your friends and family on the lanes with fast, tight shot groups. You will be firing 100 rounds with your pistol at a paper target on the range. * Holster – Strong Side either inside or outside the waistband. Must cover trigger. Instructor must approve holster for safety reasons.